Reverse inspect in Live Preview : Brackets 1.9 ships with Reverse-inspect in Live Preview. Now clicking on an element in Live Preview highlights the corresponding tag in the source code. Support for “Replace All” action in Find & Replace : Brackets now supports “Replace All” in Find & Replace along with batch operation. Download count display and extension sorting based on download count : Extension Manager now displays download count for listed extensions. Extensions can be sorted based on download count or published date in ‘Available’ and ‘Themes’ tab. Mode toggle in Untitled document : Language mode can be toggled for Untitled documents. Code coloring and Code Hints for the selected mode are also supported for Untitled documents. Document toggle in split view : Focus can be swapped between panes using keyboard shortcut. 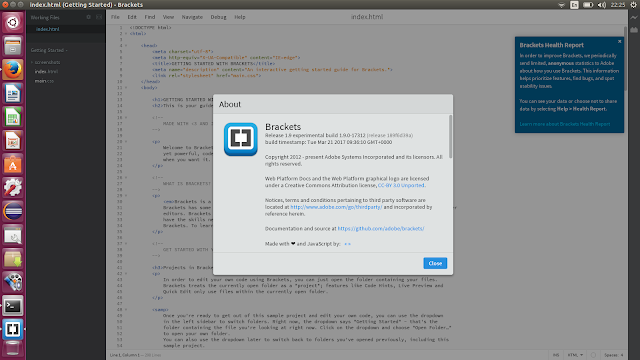 Github organization support for Brackets extensions : Github organizations can now own brackets extensions. All public owners of organization can update extensions. Codelobster IDE works better for me on Ubuntu.